Can I just say, first of all, you guys are awesome with the advice. Most recently it was the midterm tips (so helpful, by the way). But even earlier this month, I picked your brains for money saving strategies. I had just gotten my first part-time paycheck and felt sure that, even with my new proposed budget, I’d be dipping into savings before I got paid again. I know it can be taboo to talk about money, but I really just wanted to share that, thanks to your advice, not only was I able to stay within my budget, but I was also able to save. And even end up with money left over in my allowance. I know it’s only been one pay cycle, so who knows if this is sustainable, but it’s small victories like this that really make me feel like I have my act together (whether or not that’s true). It also makes me want to go out and buy myself something nice as a reward, but that may, in fact, be counterproductive. Fast forward to today, and what do you have? National League East Champions. Again. Plus a chance at finishing with the best record in baseball, which would just be icing on the cake. And you know what goes great with cake? Champagne. The kind you get when you’re celebrating certain wins in October baseball. You know, just throwing it out there. 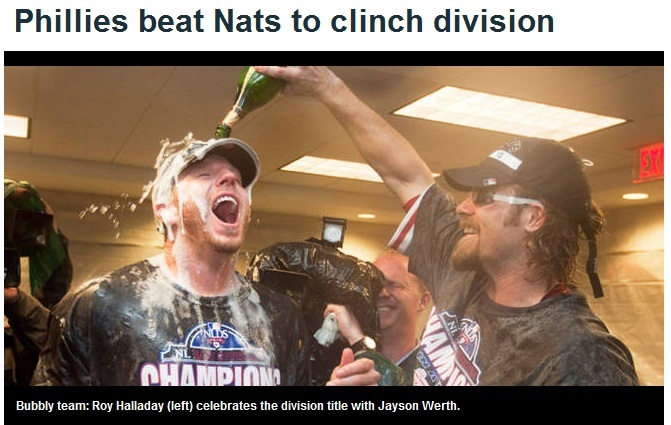 But if I were really lucky, I’d actually be IN the locker room during that champagne celebration. Sometimes, in between getting out of work and going to class, I like to sit in the park and read. I’m usually the only one in there – it’s a tiny one, across from the school – and it’s relatively shaded and peaceful. Until the Bird Lady came. A little background: I’m not shy about the fact that I have a slight fear of birds. And I know it might sound crazy, but the beaks and wings and everything coming at you all at once can be a little terrifying. And the birds and I, well, we should have an understanding. I’ve never chased them; I’m never mean. I prefer the live-and-let-live course of action – letting them live far away from me, of course. But we don’t. So, back to the park. I was sitting there, minding my own business, keeping my eye on this one brazen pigeon who seemed like he wanted nothing more than to peck at my toes. But he was the exception. The majority of the birds were leaving well enough alone. Until that goddamned Bird Lady. She waltzes into the park like she’s in a Disney movie and just starts flinging birdseed every which way. I almost expected her to break out into song. And what do the previously calm pigeons do? With a collective whoooooosh of wings, they all fly up and start attacking the birdseed. And I realize that there are far more birds around me than I initially thought. And now they’re hyped up. Bird Lady continues to toss out birdseed and then even some nuts, because it’s not enough to rile up the birds. She’s trying to get the squirrels in on the action, too. And the entire animal population in the park is in a frenzy, so it’s clearly working. You’d think they hadn’t eaten in forever. But then, Bird Lady just leaves! She just empties her feedsack and bounces, leaving the creatures all amped up! So who do the birds turn to when the lady with the food is gone? That’s right. The only other human in the park who was just innocently sitting on the bench trying to figure out offensive realist theory. I tried to wait it out. I really did. But I think the fear just gets worse as time goes on, and Mr. Brazen Pigeon was even bolder after getting fed. And he was bringing his friends. So I admitted defeat and exited the park. I’m not proud, but these things happen. Though, if Bird Lady makes it happen again, I’m going to have to give her a piece of my mind. Probably under my breath, though, since she might sic the birds on me. Sometimes when our staff meetings run long, I take the opportunity to zone out and observe my co-workers. Not in a bad way, but in an “ooh, I like her top” or an “I didn’t think we could wear shoes like that” or “wow, that’s a bright pink tie!” kind of way. But, I will admit, that sometimes, it’s in an “ah…why would you do that?” kind of way. I’m thinking of one particular culprit. We’ll call him WG and he’s a late 20s something who has previously worked in an office environment and is a generally good dresser. So he should know. BUT he regularly wears white ankle socks with his dress shoes and slacks. Does it sound like I’m being overly nitpicky? I’m sure it does. And I’m also sure that the socks don’t matter when he’s standing. But when he sits across from me for an hour and a half with his legs crossed and pant legs riding up, well, it’s both obvious and distracting. Even more so when he’s flanked by gentlemen who are sporting standard black or argyle – that white (and exposed skin) really jumps out at you. And here’s the other thing: another of our co-workers has actually said something in passing to him about the socks. (See?! I’m not the only one who noticed!) But it hasn’t changed anything. And no, it doesn’t hurt or affect me at all. I shouldn’t really care. And I don’t lose sleep over it at night (though, this post may have you wondering). But I’m just plain curious. Are white ankle socks and suit pants okay now? Please, gentlemen particularly, enlighten me. Because it just looks so out of place. Just a year ago I was less than pleased with the idea of having Michael Vick on my Eagles. I told you all, I believe in second chances, but couldn’t someone else have offered it to him? Why us? And then, resigned to the fact, I thought, well, it’s fine if he’s on the team, as long as I don’t have to cheer for him. I guess now is about the time that I start eating my words. Michael Vick is officially the starting quarterback for the Eagles. And I’m oddly okay with this. First of all, I don’t miss McNabb. Yes, Redskins fans, I know he led you to a victory against the Cowboys. I know that many of you think that we don’t appreciate everything that he did for Philly, but we do. We just got tired of getting so close to a Super Bowl and never getting a ring. So it comes down to Vick. And watching the game on Sunday against Detroit, I have to say it: I was impressed. Sure, the Eagles tried to give the game away toward the end. And there were far too many penalties for my taste. But from what I could tell (and I’m clearly an expert), he was on his game. I may still be focusing the majority of my sports attention on my Phillies, but Sundays are for the Birds. *Yes, I know that it’s not really Kolb’s fault, and that he clearly needs more blocking. That’s just not the point, though. I love the color, I’m just not really a bow or gathering kind of girl. But hey, it’s not my day. 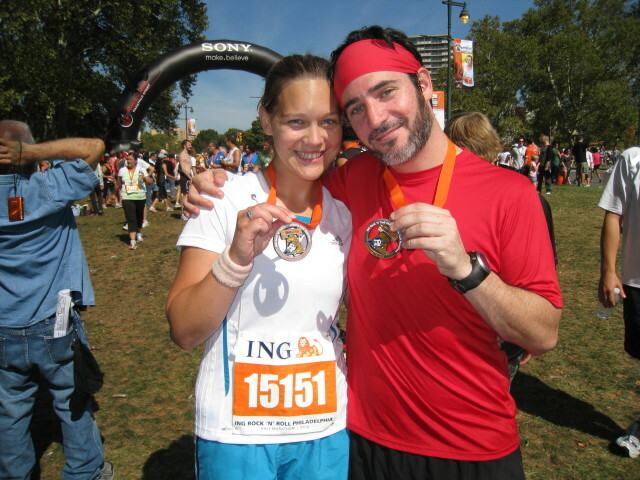 …running the Philly Rock ‘n’ Roll half-marathon! See me amidst all the pink? The guitar! The sparkles! And it’s even heavier than last year! My actual time may not have been as good as before, but the experience was right up there. 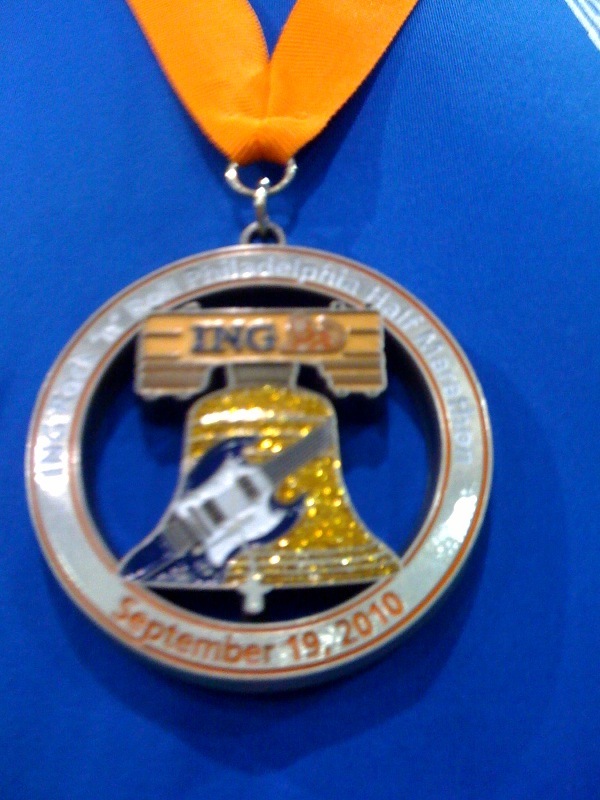 Plus, reward me with a medal like that, and you can be sure I’ll be back next year. 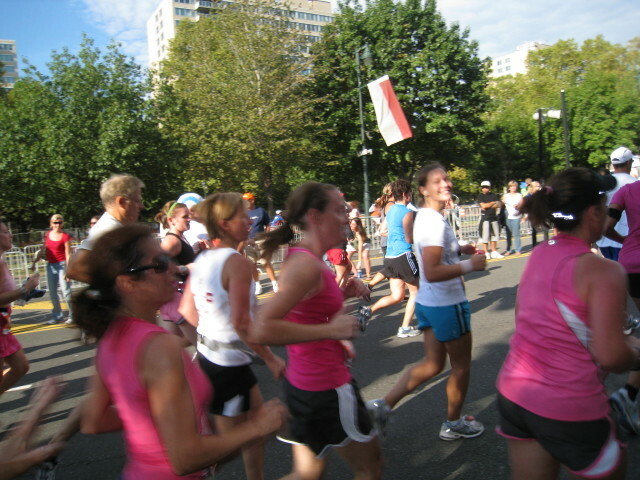 I’ll run it as many times as it takes for my parents to see me cross that finish line.